The Gnome Garden across the street made the front page of the Grimsby NewsNow newspaper yesterday, with Laurie-Ann pictured next to her gnome, named JR. The headline is "A home 'gnome' more". This is complemented by an Editorial on the last page. Laurie-Ann's story book-ended the newspaper. The editor, Mike Williscroft wrote a great editorial with a message delivered with fun and humour. He titled the editorial 'Say "no" to gnome profiling". It starts with: "OK, let's get right into this gnome thing..."
Here's the online edition for you to look at. 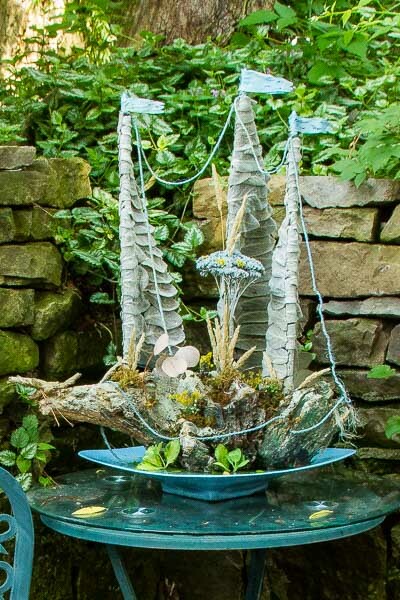 Our picture today shows another whimsical garden story, from last year's Hamilton Spectator Open Garden Week. I hope this homeless gnome story continues - it has whistle-blowing and entertaining - a great combination in news.